The German Missionary Society (subsequently became the Basel Evangelical Missionary Society) came into being as a result of a pledge taken by few dedicated Christians at Basel in the face of a military threat. It was the year 1815 when Napoleon had escaped from the Island of Elba (where was a prisoner), and landed in France. The War continued in Europe. The City of Basel was very close to the borders of Germany and France. The French General Barbanege threatened to blow up Basel. A group of pious Christians, both Clergy and Laymen, belonging to the Reformed Church of Basel and the Lutheran Church of Wurtenberg pledged to start a seminary for the training of Missionaries, if God would spare their city. The Tartars and Calmucs marched through Basel to invade France with the Russian Army, made these people feel even more convinced regarding their seminary. The French General capitulated and Napoleon met his doom at Waterloo. In the same year, on 26th September 1815, six Christian men, a Professor of Philosophy, three Clergymen, a Merchant and a Notary, gathered in the Rectory of St. martin in Basel under the Presidency of Rev. Nikolaus von Brunn, constituted themselves as the Evangelical Missionary Society of Basel. The applied to the Government for permission to start an Institution for training Missionaries. On 26th August 1816, this Institution was opened with seven students with Rev. C.C. Blumhardt in charge. The Institution did not have plans at that time to do direct Missionary work, and only set about training people from the British and Dutch Mission Societies that were already engaged in evangelistic work. The largest number of trainees were supplied to the Church Missionary Society and were sent to India to serve at their Stations. This met with a lot of trouble as the East India Company did not permit non-British Missions to work in the territory occupied by them. But a revision of the Charter of 1833 removed this obstacle and non-British Missionary Societies were allowed to function. Much before this in 1821, the Basel Mission Society began to establish centres of it's own, in Western Russia and then the Gold Coast in West Africa. Having set up may Churches in Europe, the financial position of the Basel Mission Society decided to set up Institutions in areas of India that had not experienced Protestant Missionaries. So on 12th February 1834, three Missionaries were sent to India to establish Basel Mission Stations. They became the first Continental Society other than the Tranqueba Mission to take up work in India. The three Missionaries were Johan Christopher Lehner, Christian Lenhard Greiner, and Samuel Hebich who set out on 31st March 1834 and landed in Calicut on 21st August 1834. The came to Mangalore on 30th October 1834, where they were joined by four more Missionaries. 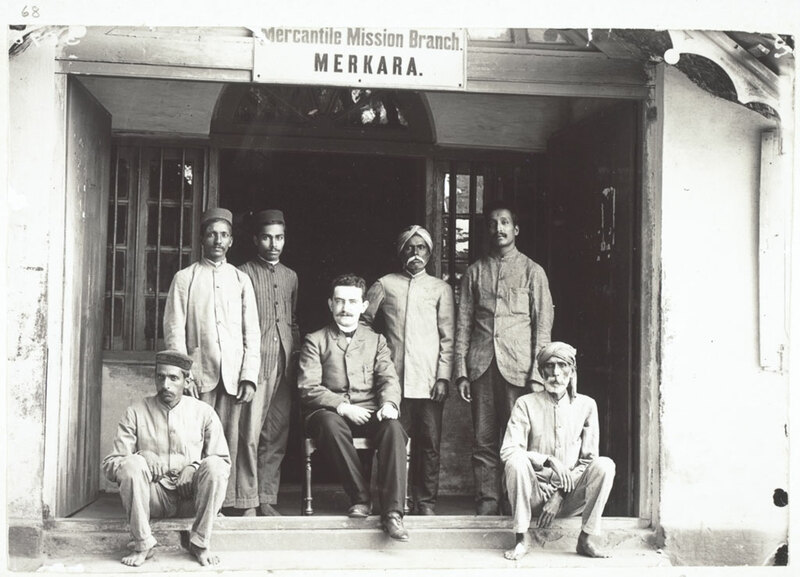 The Missionaries felt that the best way to fellowship with the converts was to keep them well occupied in some productive work, hence they got involved in the Industrial Sector in Mangalore (South Kanara). The original Commission with which the Missionaries were sent to India was to establish schools and also institutions for training future catechists. The mission of educating was considered important. So wherever there was to be a congregation, there had to be an elementary Christian teacher. Besides elementary education they also began to train people to be catechists as early as 1840. The field experience soon made the Missionaries feel that they needed to involve themselves in creating some remunerative jobs rather than just educating people. An important problem the Missionaries had to face was the economic backwardness of a large portion of their congregation. The Basel Mission was thus faced with the problem of handling this situation. The traditional professions were considered not adequate or not acceptable to the new religion. So alternate jobs had to be found and the Missionaries tried to provide them. As early as 1840 the Mission did some experiments to rehabilitate people. That year the Mission was presented with a piece of land near Mangalore by the Collector H.M. Blair. Rev. Samuel Hebich tried coffee plantation but had to give it up soon as it did not prove successful. Meanwhile, there was an attempt to make sugar out of tiodddy. But that also proved not profitable venture because of the expense of fuel which was too great. The Missionaries then thought of farming as many of the Missionaries came out of farming families and were greatly interested in agriculture. On 21st December 1842, Mr. Supper wrote to the Home Board at Basel for help to start agriculture in South Kanara. This request was followed by another made by Mr. Greiner. The Board with some hesitation approved this as a temporary measure. To implement this the Mission bought land and gave it on lease for cultivation. However, the agriculture settlements proved a partial failure since very few took interest in cultivating the lands as their own lands. There agriculture Mission was finally discarded in 1880. After the failure of the agriculture mission, the Missionaries conceived of an Industrial Establishment as a better alternative for creating jobs. This historic tile from the Horoor Estate property is dated 1865, indicating the estate's long history back to the rule of the British. Way back in 1846, the Basel Mission started an Industrial school t train people ion weaving, carpentry, clock making, etc., with the help of some local artisans. Since it did not fulfill the expectations of the Missionaries, it was given up. An Industrial Commission was appointed to look at the various Industrial opportunities. In 1848, two lay-Missionaries, Bosinger and Muller, were sent to South Kanara to teach some new trades. These lay-Missionaries were by profession a carpenter and a locksmith. But both of them had learned watch and clock making before they were sent to India. They tried watch and clock manufacturing in Mangalore. But their efforts failed before long. In 1854, watch and clock making was given up as it was found not suitable to the capacities and requirement of the people. The first important Industrial undertaking which met with success was printing press with book binding department attached to it. The printing press was started in 1841 at Mangalore. First lithograph and later Kannada types were introduced. In 1851, a printer from Basel came with Kannada fonts/types for the press at Mangalore. The press thus provided employment to may people. Besides Christian books, books related to social sciences, arts and literature were also published at the press. A few well known works which came out of this press were Kittle's Kannada-English Dictionary, Ziegler's English-Kannada Dictionary, Malayam - English, English-Malayam, English-Tulu dictionaries and so on. Since the press was expanding, a big new building was built in 1913 giving regular employment to the people. A binding section attached to the press provided employment to many more. A separate book shop was opened in 1869, to sell the publications of the press. In 1844 the Missionaries who knew a little about weaving business took initiative and started a weaving industry to give employment. Local weavers were also employed to train young boys. But soon they found that the local looms could not compete with the Western Mills. In 1851, Haller a European weaver was sent and he erected a little factory in Mangalore with 21 handlooms of European construction and a Dye house. He was the inventor of the color "Khakhi" and Khakhi cloth now known all over the world was first manufactured in Mangalore. Soon the weaving industry proved to be a success giving many people employment. A branch was opened in Mulki in 1853. The apprentices in this industry were also taught tailoring and embroidery. By 1870 the Basel Mission weaving Establishments in various places were not only paying for the cost of the Establishments but also made some profit. In the year 1851-52 when the Mission faced failure in it's agriculture programmes and only partial success in Industrial enterprises, the visit of an inspector from Basel proved to be very valuable and resulted in the inauguration of a new policy regarding Industrial enterprise in South Kanara. It was concluded that Industrial training must form part of the activities of the mission in India. Though the Industrial Commission was formed in 1846, it did not get involved in much business. But the new outlook and stress for greater involvement gave a boost to the Commission. IN 1852, the Commission was made a department of the Basel Missionary Society with a separate treasury. One of the most eminent Citizens of Basel, Mr. Carl Sarasin accepted the Presidency of it. The Commission felt that to run all the Industries good management was necessary. So the Industrial Commission in 1854 sent Mr. Pfleiderer to India for this purpose. He was responsible for the purchasing of the raw materials and the sale of the finished products. This was the beginning of the commercial enterprise of the Mission, which aimed not at profit making but teaching how to conduct business on Christian Principles. The work of the Industrial and commercial activities required larger capital. To meet this need a joint stock company was formed under the name Mission-Handels-Gesellschaft (Mission Trading Company). One of the new major Industries started after this new policy was a Tile Manufacturing Factory. As the South Kanara gets heavy rains during the Monsoons Missionaries thought that good tiles would be in great demand. Since the soil available was also suitable for the manufacture of tiles, a tile factory to manufacture flat tiles was started in 1865. (The tiles used for the roof of the Cantonment Orphanage or Cathedral High School on Richmond Road in Bangalore were from the first Basel Tile Factory, and dates back to 1865). The newly introduced tile industry progressed well and in 1877 the second factory was opened and the third one in 1880. These factories employed both men and women. The reports show that by 1913, the tile factories were employing 2,000 workers and were producing 60,000 tiles a day. In 1874 the mechanical workshop was founded to train apprentices in jobs like carpentry, black smithy and watch making. The apprentices were given theoretical and practical training followed by the Government examinations in these Trades. This it provided technical training and produced many skilled artisans. The product of this workshop was also very much appreciated and the proof for this in the order issued in 1912 where the Government of Madras declared the Basel Mission mechanical Establishment as eligible for supplying safes for Government Institutions. It is also recorded that its products won awards at various exhibitions. Though all these efforts started in a small way, by 1914 it had become a major enterprise in South Kanara.By 1900 they have set up missions along the southwestern coast of India, mainly in North Canara and Malabar (Dharwar, Hubli, Tellicherry, Cannanore, Calicut, Chambala, Gulegud, Belgaum, Coorg, Honnavar, Palghat, Kotagiri, Mercara, Kalkaka, Kundapu, Basrur, Bijapur, Kasargod, Puttur and Kalhatti.). Though the Basel Mission Industrial Enterprises were often criticised, they inspired may other Missionary Societies to start work on similar lines. In 1914 at the outbreak of the First World War, the Industrial Establishment of Basel Mission was confiscated by the British Government to be a German Organisation. This created a set back for the Basel Mission's work in India. After the war the Industries were managed under the Commonwealth Trust. One can say that these objectives of the Basel Mission were to a large extent fulfilled and gained desired results. Definite economic benefit was achieved for the society ad country through these Industries. However, many had to leave he district especially the carpenters and black smiths because of lack of openings in South Kanara. Since 1879, most of them ,migrated to Bombay (Mumbai). This can be seen negatively as disrupting community in South Kanara. But ready employment for Basel Mission Christian artisans at Bombay gave people satisfaction. This also resulted in the forming of the Basel Mission Canarese Church in Bombay. Though the Basel Mission is best known in India for the Industries connected with it and through the Industrial department has in the course of time become an integral part of it. The Basel Mission itself never looked upon these Industries as anything else but as for the time being necessary and useful attendants of the Mission work in the useful sense of the term.